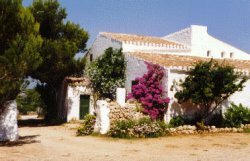 Santa Monica is one of the oldest farmhouses in Menorca. In a beautiful situation overlooking the sea and the far distant hills, Santa Monica is secluded in its own land of five acres. The house is surrounded by orchards, garden and terraces. There is a beautiful swimming pool, terrace with shade, loungers and a BBQ. 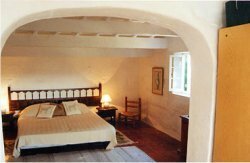 Santa Monica is about a mile from the charming village of Es Migjorn, with restaurants, good food, shopping, bars etc, and the same distance from one of the best beaches, Santa Tomas. The beaches to the South West are completely unspoilt, with the best beach bar on the island. To the South East there is a development with bars, restaurants, tennis courts, car hire, water skiing, wind surfing, medical centre, supermarkets and hotel discos. The rates are based on 12 people. Add �100 pp p.week for extra to max of 16. Possible reduced rate for less than 12.